Taking inspiration from Tokyo, where this kind of thing first blossomed, Lady Dinah's was London's very first cat café, opening its doors back in 2014. 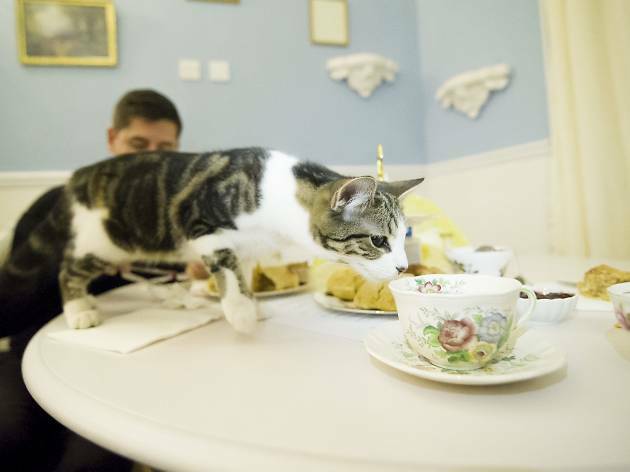 Filled with cute kitties, faux-vintage furnishings and plenty of chintzy crockery, this crowd-funded caff in Bethnal Green takes cat loving to a new level. There are 13 cats mooching about, providing the backdrop to light meals, sandwiches, salads and bagels filled with things like houmous, tomato and cucumber, egg and cress or honey-mustard chicken and rocket. High teas and afternoon teas are also available, alongside a range of interesting pots of tea – think chantilly cream tea, or popcorn green tea. These are the most jaded cats in the world. That's not surprising, given that people are probably constantly pawing at them and dangling things in front of them - they must be thoroughly sick of people. It's still fun to be around cats, though, and the food is ok. So moderate your expectations, go once out of curiosity, and you'll be fine. Very unpleased to discover the access is forbidden under age 12 once I was there. When I expressed my surprise of not having read this on the site, the young man asserted that it definitely was. I have since read the site over again and can find NO mention of such condition terms. And now I can see in the reviews that some 8 year old kid actually accessed. What happened ? We were clean, polite and anything ecpected !!! All that transportation for this kind of greeting. Very despicable ! I visited on a Saturday afternoon and it wasn't what I expected. We arrived and paid in the small room between the cats and the kitchen. The lady in the room then told us to go through to the cafe and wait to be seated. Someone came to seat us and said there were no seats left downstairs and we would have to share a table with someone upstairs. I thought this was very unusual as we had booked a table for three and assumed that a table for three would be available. As more people arrived they were told they could sit wherever they wanted and didn't need to be seated. It was all very inconsistent. Three staff asked if we had been served. We were brought an order twice. Overall it was quite disorganised. The menu could do with improving as there were several salads listed with unusual names and no description of what was in them. In the end I received one I didn't really like and would have preferred to know what I was ordering. Two of the staff were extremely helpful and friendly and knew a lot about the cats and tried to get them to interact with you. The upstairs of the cafe seemed quite boring compared to the basement. There are three large tables and a sofa upstairs and as people rarely arrived in a group of 6 the tables were being shared between groups. It was much more relaxed downstairs so we would have preferred having the option of sitting there. One member of staff was extremely rude and made us feel uncomfortable. She didn't interact with any customers unless absolutely necessary. Her only interaction was 15 minutes before closing for the afternoon break when she told a couple they had to leave within 3 minutes. Her top wasn't big enough to cover herself up and her underwear was on show for 90% of the time. Completely inappropriate for a cafe setting. The cats seemed very happy and spent most of their time sleeping in the window. There were a few who enjoyed interaction but it did feel like there were too many people in the cafe at one time to be able to spend any time with a cat. There were so many toys, several groups of people were trying to get the attention of one cat at the same time. This place was a huge disappointment. Awful coffee and cake and a bunch of cats either sleeping or hiding. That and the smell makes it one to avoid. Don't believe the hype. I wasn't sure I wanted to go to this place as my first and only experience with cat's cafes was in Japan where cats just looked so sad and distresses, but Dinah's Emporium was such a pleasant surprise. The cafe looks lovely, cats are cared for and look healthy and happy. It's so nice to think you can go there for a cuddle if you, like me, are not allowed pets in your flat! It's also nice that all the visitors are very respectful with them (at least when I was there). Its just amazing nothing will ever beat it the downstairs is lovely the upstairs is lovely the cats are lovely.Its just amazing I recommend it to anyone! They have definitely improved (as I see from the reviews) the staff are very friendly and the the food comes quick enough they have this rule for not disturbing sleeping cats at first I was disappointed but I don't think the cats would have been friendly if we did disturb there sleeping. Tinkerbell is the cat that I had most interaction with she let me play and cuddle her. the reviews at the bottom of the page describe the café very badly but I assume that is just how much it has changed. Absolute cat lovers heaven. All the cats are content and well cared for. The high tea was completely refillable and delicious and the hot drinks were also spectacular. Already can't wait to come back here. My dream place! Amazing place! Gorgeous kitties, nice vintage style furnishings and yummy food with vegan options. Back when it was announced that the UK would be getting its first ever cat cafe, I was totally thrilled, following the stories on Time Out with a keen interest. Though there were a lot of questions asked about the welfare of the cats at the time. Since visiting, I have to say it's an extremely well executed idea. Yes - This place does have its rules, which some people don't like. It's super important to respect that as the cafe is their home. Would you like it if someone came over to your place for tea, picked you up to cuddle you without permission and started dangling things in front of your face while you were trying to sleep? It's certainly a good thing they don't allow young children into the cafe to run around terrorising these poor cats! When we came to visit, many of the kitties were snoozing for the majority of it. Two little ones jumped up and napped on the windowsill whilst we were having our afternoon tea. If you let them come to you, the cats at the cafe can be very friendly and sociable. They're also really well looked after by and have such a great bond with the lovely folks who work at the cafe. We were served coffees with little cat's faces and whiskers sprinkled onto them, and slices of cake with little chocolate mice - Lots of really cute little added touches and well considered attention to detail! I've been really wanting to come back to visit this place for a while now, but haven't yet been able to since you need to book in advance, and I'm often quite last minute with plans. 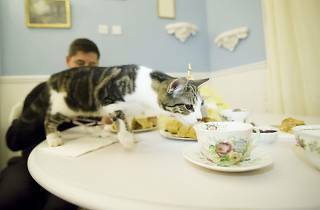 It's lovely to go for a treat and for those who would like to enjoy the relaxing company of cats over a cup of tea. You might wonder about the sanitary aspect of serving food in a cafe where cats roam free (I certainly did) but any concerns were out to rest. On my visit it was perfectly clean and the cats don't jump onto your laps or tables. In fact, sadly they are pretty indifferent to all visitors until THEY decide it's time to play. (Much like most cats!) Service was good and food was decent. They even use cute little templates to sprinkle paw prints or cat faces on to the top of you milk foam in your drink. Nice attention to detail. Cats, fancy teas, sandwiches, cake, ... Sounds like heaven. But beware, the cats are often asleep, with signs asking you not to stroke or wake them. This can be very frustrating for young visitors who end up wandering the café, twiddling a toy mouse on a string, in desperate search for an awake moggy. That said the staff are very friendly and helpful, the food is well made with as many refills of your favourite bits, and the experience is well worth it. The café itself is very nice. The décor is thought through - furniture ideal for furry friends to climb on, lots of toys… Food is great and staff is more than passionate about cats. However you might feel at first like you’ve been ripped off as there’s very little cat interaction. They’re independent, like to snooze and are sometimes dismissive. As a customer it can be frustrated. But remember that’s just normal cat behaviour and it shows they’re happy in this place. So as long as you like being surrounded by cats you’ll be fine, but do not over expect! It's nice going to a coffe shop with tea and cats, the possiblity to pet and play with them, and the staff are nice and friendly. I visited Lady Dinah's Cat Emporium yesterday with friends and we had a wonderful time. Our 'slot' was 12.30 - 2pm and we waited in the seated area just inside the door as we were early. The cats were absolutely divine! Some cats slept the whole time we were there, some were wandering about and the 2 kittens played delightfully, as kittens do. The cats are clearly very content and their welfare is put first as it should be. Patrons are kindly but firmly prevented from picking the cats up or waking them and flash photography is forbidden. The staff clearly love the cats and encourage them to play when appropriate. We had bagels for lunch and pots of delicious loose leaf tea, the food and drinks we had and saw were of high quality and fresh. Staff were around at all times to take orders or chat about the cats. I highly recommend a visit for all cat lovers. If you are unlucky and most of the cats are asleep, this shows how relaxed and happy the cats are. True cat lovers would find this reassuring if frustrating, such is the nature of the independent cat! I can't wait to go back! I was so excited to visit, thought it would be fun and cute. In reality it took 40mins for a hot chocolate. All the cats were sleeping or hiding in the corners and had disrespectful people shaking them awake and poking them. Having to endure that all day is no life for a cat. I left very disturbed and unimpressed. I hope it closes down and the animals put to a good home where they wont be used as prisoners for constant unwatted petting while trying to sleep.